In Bird City, our sense of community doesn’t end at the edge of town. Our alumni — both residents and Cheylin graduates — carry the spirit of Bird City with them wherever they go. And each summer, we celebrate their stories and accomplishments at our annual Bird City Reunion. Tickets are $15 each and available at Hometown Market (734-2050) and The Bank (734-2100). Bird City Rural High School celebrated their 91st Alumni Banquet at 6:30 at the Bird City Legion Hall. The BCRHS Memorabilia Booth at the Thresher Show grounds was open in the afternoon for the Bird City Cardinal Alumni to enjoy. The theme of this year’s banquet was “Oldies But Goodies” and decorated for the occasion. The committee members were: Sherry Carmichael, Jim & Cindy Leach, and Lynn & Candy Glasco. The banquet was opened by emcee Lynn Glasco and the invocation given by Pastor Jim Gleason. A delicious meal was catered by Kerby & Canda. 80 Alumni Cardinals were in attendance. Honored Classes were 1941, 1946, 1951, 1956, 1961, 1966, 1971. Many Veterans were also honored. It was a fun filled evening with great local entertainment and classmates reunited from Alaska to the East Coast and all in between. BCRHS Cheerleaders of all ages closed the Banquet with the School Song. Thank you to all who attended and helped make this a very successful BCRHS Banquet. We won’t let it die – we’ll keep it on the fly — Go Cardinals!!! We, Lynn & Candy Glasco (class of 1966 and 1967) and Sherry Carmichael (class of 1958) have been on a rescue mission to save BCRHS memorabilia. The trophies and cases and 44 class pictures have been found over the last year. They have been repaired and relocated to Bird City’s Tri-State Antique Engine and Thresher Show. A special thanks goes out to Rod Klepper for all his help in getting this accomplished. Rescued class pictures will be on display at the Thresher Show. We are still looking for class photos from 1919 to 1931 that the committee could have, or make a copy of, to add to the collection. The BCRHS donations that have come in over the past years will pay for set up, repairs and wall displays for the class pictures. As more memorabilia comes in, other cases and displays will be needed, as well as monetary donations. If you have something related to BCRHS let us know. (Lynn & Candy Glasco 785-734-2797). There was a nice turnout for this year’s meal and program held at the American Legion Hall in Bird City. This year, we celebrated graduates from 1976 through 2016. Special guest and speaker was Jeff Montgomery, 1992 Cheylin Graduate, who spoke of good memories about Cheylin and our two communities, and humored the crowd with his comical side. The evening ended with reminiscing, catching up and enjoying music by DJ Kelly Simmonds with a street dance out front of the Legion. 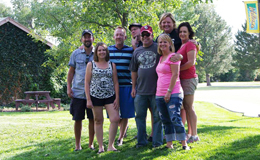 Several Cheylin Alumni gathered on Saturday, August 1, 2015 for this year’s Cheylin Alumni Reunion. A few of the classes held their own class parties prior to heading down to the Legion Hall that evening. Kerby Krien catered the meal again this year with scrumptious pulled pork and side salads. A street dance, with music provided by Kelly Simmonds, was held on 4th Street in front of the Legion. It was a big hit, with a night packed full FUN, LAUGHTER & GOOD MEMORIES!! Check out “Cheylin Alumni Reunion” on Facebook to stay updated on next year’s plans!! MARK YOUR CALENDAR for Saturday, July 30, 2016 as it is always held in conjunction with the Tri-State Antique Engine and Thresher Show weekend. A group of Cheylin Alumni worked together to organize a Cheylin Alumni Reunion for all graduates from 1976-2014. The last all school reunion was held 13 or 14 years ago, so after a little brainstorming, it was decided to incorporate the reunion with this year’s Tri-State Antique Engine and Thresher Show. 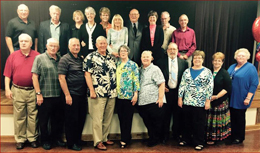 The reunion kicked off Saturday evening, Aug 2nd, with supper in the Legion Hall, come and go, between 6-8pm. Canda Orten and (Cheylin graduate) Kerby Krien were in charge of the evening’s meal, consisting of Authentic Mexican Tacos, Ribs (Full and Half Slab), Pulled Pork, and a number of sides to choose from. More than 100 people enjoyed the delicious food options made available at the Legion; while others made their way into Big Ed’s for their evening meal. A street dance was the main event of the reunion, with Kelly Simmonds (also a Cheylin graduate) owner of Cat-5 DJ Service out of Colby, entertaining the crowd till midnight. Several alumni and their families spent the evening dancing, socializing, laughing and reminiscing. The Cheylin JH and HS cheerleaders camped out for a few hours in the Senior Center, playing games and watching movies with a handful of younger kids (21 to be exact). On Sunday, a smaller group met at the park to enjoy a potluck lunch and visiting. Both kids and ‘kids at heart’ spent some time getting their faces painted by the Cheylin HS cheerleaders. The reunion seemed to be enjoyed by all, with many already asking when the next one will be. Making this an annual event, or every couple of years, is now the topic of discussion. Chime in and voice your opinion on the Cheylin Alumni Reunion Facebook page. We are missing addresses for both Bird City and Cheylin Alumni. If you have an updated address for us, please email us your updated information. We only utilize the addresses for alumni information and happenings, as well as our community newsletters.